As Northern Lights photography progressively leapt into the Digital realm in the early two-thousands, it soon became possible not only to take still images of the Aurora but also moving ones, Aurora videos in other words! As shown in the previous installments of this series, Northern Lights have been portrayed, described, painted, drawn, and eventually photographed for hundreds of years. However, there is one very popular contemporary media which hadn’t been used to capture the beauty of the Northern Lights up until fairly recently, namely film. Indeed, during the film-photography era of the XXth century, taking still Northern Lights picture was hard enough and there’s no solid evidence which suggests that the Aurora was ever captured on film in its moving state. But as film-cameras began to be replaced by digital ones, the new technology proved to be reliable enough to capture the fascinating phenomena through an ingenious technique called time-lapse. Instead of actually filming the Aurora in real-time, it was instead possible to manually assemble hundreds of still Aurora images. The final product, a time-lapse, would give an idea of the movement of the Aurora but with a somewhat jerkier rhythm. One of the earliest of such videos was filmed in 2003 in Minnesota by the news agency StormChasingVideo . Regardless of how impressive this time-lapse was for its time, one could still debate its qualification as an actual ´movie´ or ´film´. However, not long after the capture of these early time-lapses, new types of camcorders became available on the market which were powerful enough to capture ´live´ Auroras under specific circumstances. Under adequate lighting and during powerful enough solar storms, it became possible to capture actual moving pictures of the Northern Lights. Videos from 2004 in Sweden or 2005 in North Dakota, despite being rather choppy and low-resolution, represented a considerable leap forward in the way the Northern Lights are seen and conceived. Both time-lapses and full-motion videos of Northern Lights soon started to flood Youtube, which was launched publicly in 2005. Still, both the full-motion and time-lapse videos had a lot of improvements to make. Over the next few years, as digital photography and video-editing software became more common and more powerful, the quality of moving Northern Lights pictures improved dramatically. Around 2009, Northern-Lights time-lapses had become much smoother and of a much higher quality than they were just a couple of years back. Time-lapses also participated in making Northern Lights more well-known worldwide, most notably through the BBC star program Joanna Lumley in the Land of the Northern Lights which aired in 2008 and presented ingeniously-crafted time-lapses to British, and world, audiences. Still, making time lapses is much easier today than it was back then. Thanks to the success of the photo-editing program Lightroom, editing in bulk the hundreds of photos which are required for making time-lapses is just a click away. In addition, it has also become possible to mass-create ´artificial frames‘, between actual shots by ´fusing´ two pre-existing pictures in order to make the final video even smoother and more natural-looking than previously thought possible. This is how Xabi, from the Northern lights blog manages to create very natural-looking Aurora time-lapses around Tromsø, North-Norway. Xabi has also been experimenting with real-time Aurora videos and has been able to obtain terrific results thanks in part to increasingly light-sensitive equipment. Indeed, while Most Northern Lights still pictures use a light-sensitivity indicator (ISO) between 800 and 3200, new cameras can go up to well over 10000! With such light-sensitive machines, it becomes almost easy to capture the full-extent of the Aurora’s shimmering greatness, including the powerful bursts of green and purple light ensnaring the Arctic skies (actual real-time video starts at 52 seconds)! With the technology evolving at a faster pace than ever before, and the quality of sensors, screens, and cameras reaching even greater heights with every passing year, who knows what kinds of Northern Lights videos could be taken in the near future? One thing is certain though, until humanity invents a new visual media or finally engineers fully-functional virtual-reality devices, there will not be any really ´new´ visions of the Northern Lights, which means that this series shall, for the time being, cease. We hope it was appreciated and made you appreciate the beautiful Aurora even more as well! (I) Still from a live-video of the Northern Lights in Tromsø the 13th of April 2013. Ⓒ The Northern Lights Blog (2014). 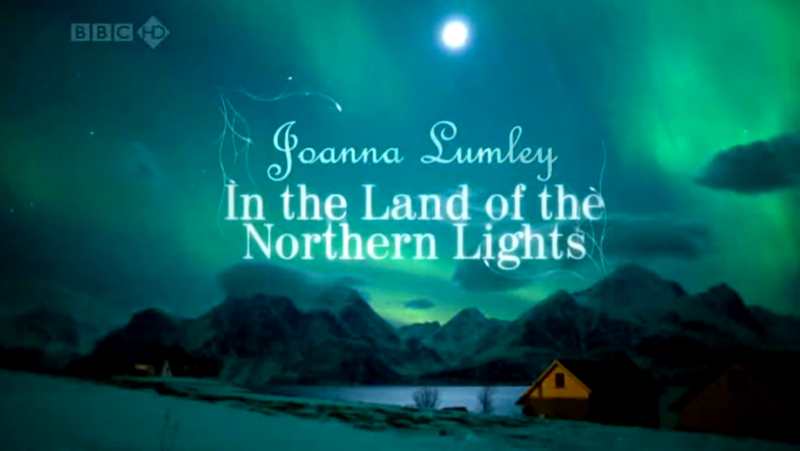 (II) A still from the BBC series Joanna Lumley in the Land of the Northern Lights Ⓒ BBC (2008.). (III) Video of the Northern Lights near Tromsø. Ⓒ The Northern Lights Blog (2014). (IV) Video of the Northern Lights near Tromsø. Ⓒ The Northern Lights Blog (2015).